A Bloomin’ Good Week in Atonement TN – It’s Catnip! Welcome, to my sanctuary. Could I offer you some coffee or tea, and a pastry or maybe a breakfast biscuit? Something more unusual — perhaps herbal tea… maybe even catnip tea? I had a few days away from my job, and other than a migraine and snow (both on Thursday), it’s been great. Of course there was a lot going on, just the same — and stressful as you might guess by the migraine. But it’s all good now. I’m finally relaxing a bit. My head is still in my Atonement, TN universe because Atonement in Bloom got two reviews this week! I’m really excited about them. Thanks to Barb Taub for sharing her review of Atonement in Bloom. I’m thrilled that she enjoyed my latest release. If you haven’t read the first book (Atonement, Tennessee) you might want to stay here though, if you’re hyper sensitive to finding things out anyway. Teri Polen also did a marvelous review. Teri’s post and the comments got a conversation started about Atonement’s part-time narrator, Lilith the calico cat. At Teri’s the kind and fun suggestion that Lilith should have her own book became a catalyst when it mixed with an idea that’s been catnapping in my brain. I think I’ve figured out how to tell book-3! I had been stumped as to how I should go about writing that story, but now I have some ideas simmering. Speaking of that catnip loving feline, with the the first book I did a character interview with Lilith. Sorry if I seem like a cat with a bowl of cream, but I’m so pleased with these, and all the reviews “Bloom” has gotten. …Do you detect a feline feeling with this post? Many people are familiar with the effect catnip has on most cats. In the Atonement universe, Lilith the calico is no exception. Moreover, Gwydion is sort of Lilith’s “catnip” figuratively too. That leads the calico into a bit of trouble in “Atonement in Bloom,” but I don’t want to spoil anything by telling you about that. Gwydion has flower magic. Cats might act like they’re under a spell when they get some “nip” but there’s science behind it. Old meanings associated with flowers (or the language of flowers) are mentioned in the Atonement novels. I didn’t think catnip was included in that, but I found something for it today. Some say it symbolizes love, beauty, and happiness. It certainly tends to make cats happy! If you are concerned about the origins of store bought nip, you might grow your own. You can use it yourself too (if you can get it away from your cats). For humans, catnip tea is supposed to “provide a mild euphoria” but in my experience, the effects are so mild as to be barely noticeable. 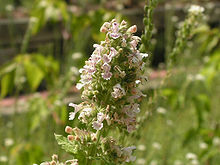 However, it is reputed to have other benefits, such as anti-inflammatory, and as an insect repellent. You might find you have helpers when you harvest it. Here’s a fun video about growing your own catnip. Thanks for visiting. I hope you’ll join me Wednesday for Hidebound Hump Day and another chapter of Copper, the Alchemist, and the Woman in Trousers. If you missed the last chapter, here’s a link to Crinoline, Lye Soap, and Caterpillar. The random “things” driving the next week’s episode are Pen Knife, Indian Head Penny, and Brocade of a White Lion. Yes, somebody actually got that detailed with the random “things”… but I managed to continue the story. I’ll be looking for you at the station! Remember, book-1, Atonement, Tennessee is on sale for 99¢ for the e-book.